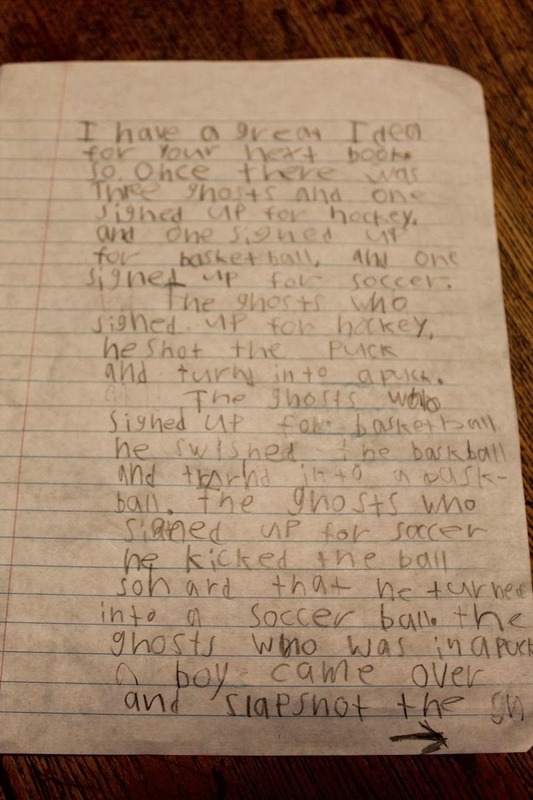 Three Ghost Friends: Sports Ghosts.....A GENIUS IDEA from a first grader! 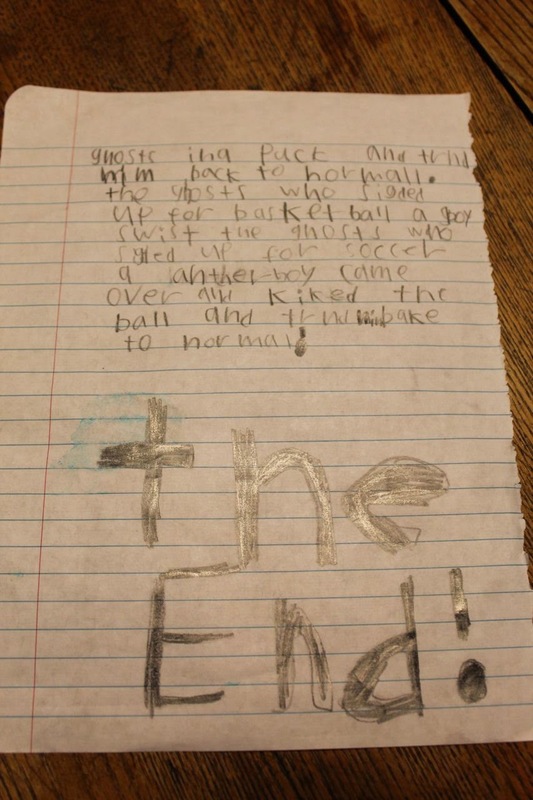 Sports Ghosts.....A GENIUS IDEA from a first grader! A couple of weeks ago I had the pleasure of visiting two first grade classrooms at Craddock Elementary School. I visited one classroom on Wednesday and then returned on Friday to visit the second classroom. Upon returning to the school on Friday, the teacher from the first classroom gave me a piece a paper from one of her students. The next sentence jumped right into a story about three ghosts that "sign up" to play sports. One ghost decides to play hockey, another ghost decides to play basketball, and the last ghost decides to play soccer. 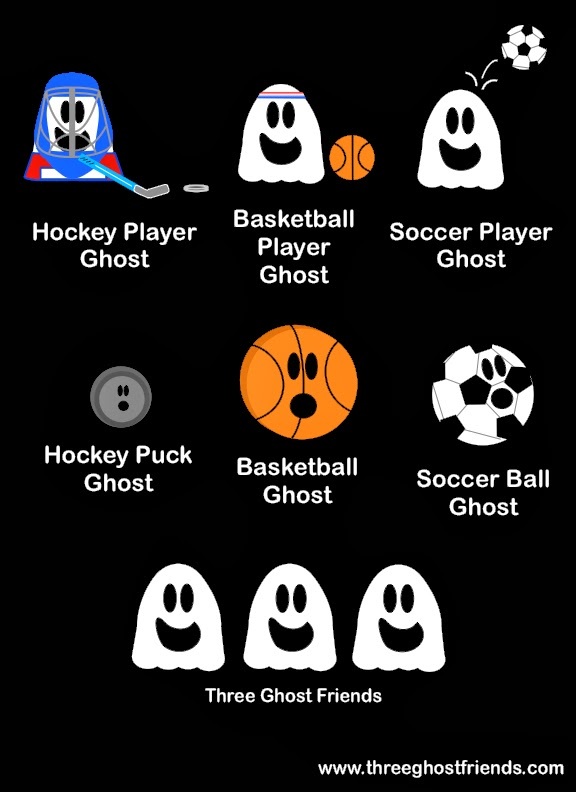 Unfortunately, each ghost turns into something while they are playing their sport -- the hockey player ghost turns into a puck, the basketball player ghost turns into a basketball, and the soccer player ghost turns into a soccer ball. Luckily, a few boys save the day and turn the ghosts back to "normal"! What a genius idea!! I loved it. The student's story has been sitting on my desk since the day I received it. I didn't know exactly how I should respond. Tonight, I had a few extra moments and I decided to try to illustrate parts of the story using the THREE GHOST FRIENDS. I decided this was the best way I could say "Thank you!" to the student for making my day.